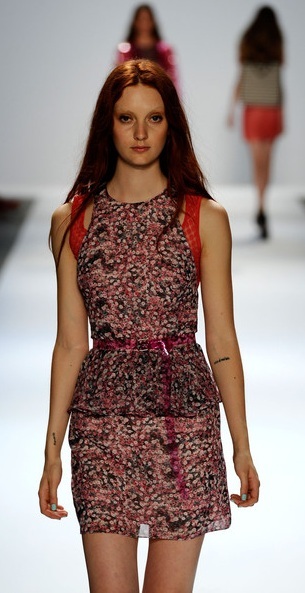 Spring 2013 is by far my favorite Charlotte Ronson collection to date. The cool, girly chic looks combined with edgy details feature peplum mini dresses, shells, athletic shorts, flounce skirts and varsity jackets that are flattering for petites. My top picks include the ocean stripe peplum mini dress, calypso dot tulle draped dress with cut-out, midnight leather bralette, ivory daisy embroidered organza peplum dress with leather detail and midnight dot tulle varsity jacket. Accessories include floppy marine totes and duffels, herringbone stripe clutches and totes, crossbody bags and satchels, bucket bags and miaudieres.